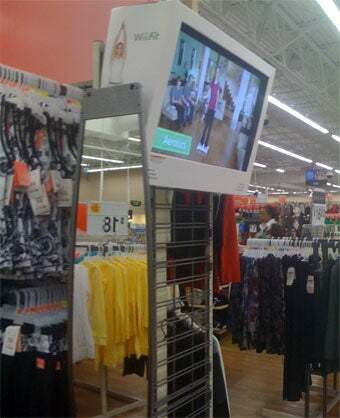 Attention, Wal-Mart shoppers: the mega retailer is currently doing massive reductions on women's self-esteem, moving the Wii Fit advertising kiosks from the electronics department to women's clothing. A diabolical tactic! Yes, that's a full length body mirror adjacent to the Wii Fit kiosk, a deviously placed hint that's not so subtly telling Wal-Mart shoppers "Hey, time to put the Oreo Double Stufs down and get some Wii Fit yoga done, chubs." We don't know how far or wide the appeal from Wii Fit to chunky women has been deployed, as reader Zach is our source for the conspicuously placed display. But we hope they erect some near our local mall food court — right next to the Cheesecake Factory seems appropriate. Actually, scratch that. A quick flashback to my last Wal-Mart shopping experience makes me think the clientele here are probably a good crowd to target.